Everybody, middle aged and up still has good memories of his childhood. It was a time of carefree enjoyment. Just live for the day, without any worries to pay the rent, electricity, food or any other obligations. Stress? What’s that? A life, only childhood can give you. Today children are already small managers, with all of its obligations as a busy scheduled calendar with little free time. The reason for it is twofold: firstly, these days there are much higher academic requirements. Secondly, there is a much larger range of past time activities, a massive flow of information and generally higher expectations of children and young people. Those expectations not only come from school but from their parents alike and the whole social environment, which also includes their friends. It is hardly surprising that young people today already suffer from increased stress, with all the well-(and lesser) known negative consequences. 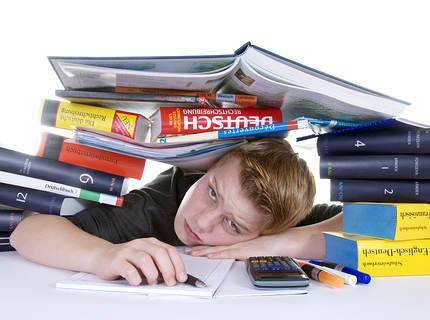 What are the psychological causes of stress in children and adolescents? The transition from childhood to adulthood is associated with great psychological stress, which in turn is considered the catalyst for the increased stress level. Letting go of the parents and finding one’s own identity adds the burden and stress. In addition, the development of the body, both in girls and boys, triggers uncertainty and thus mental stress. The adolescents must find his in place in the gender role - a process that may take some time to complete. The ongoing pressure from school, the demands of parents and friends lead to substantial psychological burden and subsequently to stress. Ultimately it’s all the requirements pattering down on the adolescents which eventually result in fear of failure. Like a revolving door, that creates even more stress. There are all kinds of uncertainties with your own body, cutting the umbilical cord to the parents and last but not lease, their own future. Questions, problems and feelings, all are looking for answers. Left to manage all by himself the young person might not find his own responses. Fear, shame and false pride, after all, you are not supposed to have problems, only worsen the situation. All that mentioned above contributes to the actual stress. 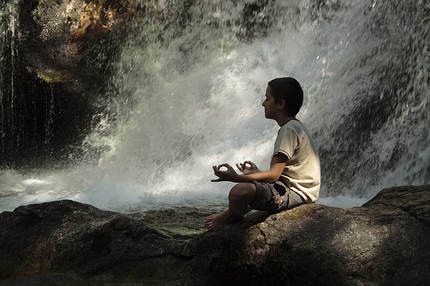 How does stress affect the body, mind and soul of children and adolescents? In general: Increased stress over a prolonged period affects children and an adolescent similarly as it affects adults. Due to the immature development of the young person the consequences can be far more dramatic. Given this scenario, parents increasingly requesting answers for how to prevent or at least help with the increased stress of their children as well as seeking for solutions to reduce the already existing pressure. First of all: The increased requirements, especially through the school system, are unlikely to reverse, even with the most involved parents. Therefore, the next approach would be to accept this fact and to make the child as fit as just possible for it. Nevertheless, parents should do their part of not putting more pressure on the child and expect top performance every single time. Making sure that your child understands that you always have his back. That he does not have to be ashamed when things go wrong or he has difficulties to cope. At the same time, it is important for parents to recognize if things are getting worse. It should not be underestimated how far a child is willing to go to impress parents, teacher and friends alike. Hence, might put himself under (unnecessary) stress to get on top of the (supposed) weight. Once stress has already manifested, and first physical, mental and emotional symptoms start to show up, targeted relaxation exercises can promote relief. These relaxation exercises can take shape in form of, autogenic training, yoga, meditation or progressive muscle relaxation. Even hypnosis can help to change the attitudes and inner beliefs about stressful situations and thus promoting positive handling of it. Furthermore, parents should make sure that their child undertakes exercises to balance their stress on a regular basis. In general, that may involve sports or any other activity to counteract stress. The magic word is: “Work – Life – Balance” (Note: in English it is much more common to say: Life – Play – Balance.) This means the right balance of work (which sometimes can be stressful) and appropriate relaxation and leisure activities. It is also important to motivate the child repeatedly or to keep him going with small rewards. A motivated child will cope with a stressful situation much easier than a child that has lost its aspirations. Schools and parents are equally challenged when it comes to walk the fine line between not putting more pressure on the young person while at the same time teaching them, to cope with the inevitable stress as relaxed as possible. Unfortunately, this is not widely recognized within educational institutions. There are only a few schools taking the issue of stress prevention in the classroom seriously. The aim is to explain to the students that the external stress is not an evil, they are supposed subject to passively. The aim would be to show the young person ways on how to handle or defuse stressful situations. After all, what this is really all about, is, to let go of existing stress and whenever possible, relax; physically, mentally and spiritually. The ultimate goal for the growing person would be to understand, that problematic situations are part of everybody’s life. The challenge is to find ways to master those situations. People who have learned that, will handle stress quite differently than those who react impulsively to stress and, therefore, add to the already existing stress. For a young person to develop a healthy personality, creativity and imagination it is an imperative, to give them regular downtime for rest and relaxation. Parents, schools and teachers are asked to create the necessary conditions for it. After all, only children are relaxed and happy kids! Youth-, leisure- and other group work face the task to put a counterweight on all the challenges the kids encounter so that stress does not come up in the first place. Nothing is more suitable for this but joy and fun. If they are doing something fun, stress will not evolve to a situation making them feel like: this is killing me. How's that? Appreciation: when we feel valued, we experience less stress. If we experience fun something comes back: appreciation, recognition, and praise. For children and adolescent much more comes back then for adults: young people can be inspired! Team spirit: doing something together is at any time better than doing it alone and feeling overwhelmed. Finishing together seems better than having to it all by myself. No pressure to perform: in youth-, leisure- and other group works there is not the pressure to perform, as it is at school or at work. Of course, you can build up pressure to perform – for example as it is in some sports clubs. However, this is fun and you also experience team spirit and appreciation. Therefore, this is not the stress which eventually gets you psychologically down. No nagging – everyone is just the way he is. Usually, children and young people experience criticism wherever they go. If we, as youth workers, can create a climate free of this criticism, where every child is accepted just the way they are, what will happen is, children and young people will joyfully come to the programs. Most likely it will not always be possible to completely refrain from criticism, but much depends on the tone and manner we chose to talk to those growing people. Recreation: time well spent in youth groups should give the children recreation and opportunities. To meet up with their peers, talk about what they would like to do and all that without pressure, without nagging. – For once doing something else – just having fun! A balanced age-appropriate program will support all that. Test mode - constructing life experiences: youth work offers vast possibilities to “give it a crack.” Here the young people have the opportunity to gather experiences which are necessary for their future lives. For example, how to fit into the community, take on tasks and responsibilities. For older teens, sometimes responsibility can be delegated and they can take on some leadership tasks which will help them one day at work. The important thing is that young people have a go without being laughed about, without looking stupid. After all, nobody is perfect. Contact person: in all youth work it is paramount to have staff which are able to build therapeutic relationships with young people. Staff who have active listening skills, staff who are on the same wavelength like the youth in their care. Without this therapeutic relationship and the same wavelength, it’s almost impossible to succeed. It cannot be stressed enough how important it is for young people and parents alike to find a place the can fall back on. A place they can come and talk open and honestly, free of fear of humiliation about their problems. This helps to release stress. Enlightenment: It is important for the youth worker to know that the cause of stress often can be traced back to a fear of failure. (I can’t do this, I am unable to, etc. ), yet, everybody wants to look good in the eyes of everybody else. Dialog within the youth group is of essence. Talk about why it is so important for you to always look good in the eyes of others, give your fear a name and then offer tips and strategies to counteract stress. As a guideline, you can use the tips listed above.